This model will be back in stock in July 2019. 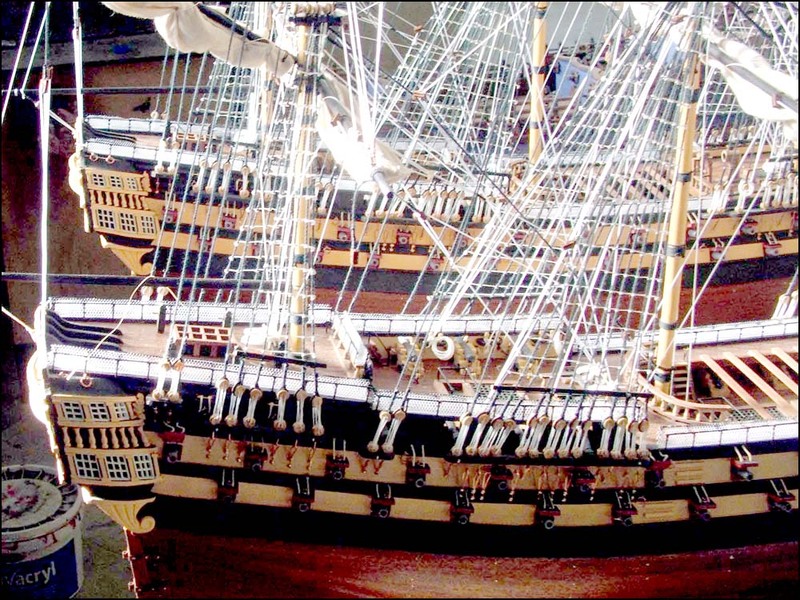 This is a large-scale replica of the HMS Surprise and it has a copper-plated wooden hull. made famous by Patrick O'Brian's novel " Master & Commander". She was constructed in Le Havre as L'Unité in 1794: a 24 gun corvette, armed with 8lb long guns. She was captured in the Mediterranean in April 1796 by the British frigate Inconstant and taken in as Surprise. She was re-armed and classed as a 28 gunship with 24 32lb carronades on her main deck, 8 32lb carronades on the quarterdeck and 4 6lb long guns on her foredeck. She sailed to Jamaica in July 1796 under the command of Captain Edward Hamilton. The big moment in her lifetime was the extraordinarily audacious cutting out of the frigate Hermione on 24th.October 1799. The Surprise sailed back to England where she was sold at Deptford in February 1802. Part of her story was dramatized by Patrick O'Brian and depicted in the movie Master and Commander.